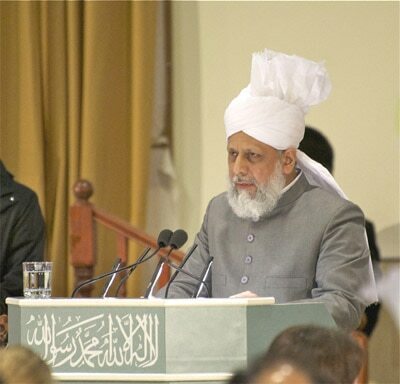 Keynote address delivered by His Holiness, Hadhrat Mirza Masroor Ahmad, Khalifatul Masih V, Head of the Worldwide Ahmadiyya Muslim community (may Allah strengthen his hand) at the Ahmadiyya Muslim community’s Peace Symposium held at the Baitul Futuh Mosque on 20th March 2010. All the distinguished guests gathered here tonight, Assalamu ‘Alaikum Wa Rahmatullahi Wa Barakatuhu – peace and blessings of Allah be upon you all. After another year, a lovely evening has once again come when our dear friends belonging to different faiths and countries, but who are mostly British, have gathered here because they have a connection with the members of our community. Some are old acquaintances, of course, and others are new. The fact that people of different countries, religions and cultures have come together and spared us their valuable time proves that they are all noble and decent persons with a desire for achieving a high objective, an objective that is the burning desire of every sincere person in this day and age. And so today, we have gathered here to talk about and listen to that word that can bring about tranquillity and contentment within our heart, and that word is ‘peace’! This is but one word, yet it guarantees the tranquillity of one’s heart; it is the guarantor of the tranquillity of our home; it assures the betterment and welfare of society; and it guarantees the prosperity of our nation. So, when this word confers so many benefits then why should we not find it attractive? Why should it not be the burning desire of the heart of every good person? To achieve anything, you must work hard for it. You have to make sacrifices. The higher the objective, the higher is the sacrifice required. It is necessary that a code of conduct be established in which a person has to sacrifice his or her emotions and respect the feelings and sentiments of others. It is necessary that a person should stand on his own two feet and safeguard himself from envying the wealth of others and it is necessary that one should help the poor and yet be happy to live within one’s means. In short, if you desire to establish peace at any level, then it is essential that high moral values are exhibited, and guidelines need to be established for this. The Holy Prophet of Islam, peace and blessings of Allah be upon him, has taught us a golden principle, which is to choose for your brothers what you choose for yourself, because the lack of peace is caused by an anxiety of the heart. If we look at the world today, the majority are victims of deprivation, cruelty and injustice. Many powers are cruel and unkind to their own people, whether the cruelty is in the name of religion or the State itself. And Western governments, directly or indirectly, are involved in this oppression. And these anxieties are borne whenever deprivation is felt; when one feels oppressed; when one feels inferior and feels that there is no hope for justice; when the gap between the rich and poor widens; when one feels that there is a lack of equal opportunities for progress; when there are interferences in a person’s faith by the powerful; and, when a country tries to prove its supremacy over another, and in the name of aid a superior power tries to take hold of the resources of another country. When this golden principle is forgotten – of choosing for your brother what you choose for yourself – then these and many other similar factors blow peace into pieces. It is extremely difficult to live up to this golden principle. If we reflect upon these major factors that I have spoken about that are required to establish peace, then disregarding self-centred persons who only think of themselves, even those who truly long for peace do not follow this principle to the standard required. And that standard, of course, is that what you choose for your brother you choose for yourself. There are many people who want to create an atmosphere of love, affection and brotherhood, yet how many people are actually willing to sacrifice their own wealth so that the situation should improve and restlessness should end? At an individual level there might be a few exceptions, here and there, where perhaps many people give a petty sum of charity, but it is an insignificant sacrifice and they are barely willing to forsake their emotions. When a large chunk of society and many countries become the victims of deprivation and cruelty, and become restless due to injustice, then hatred grows and such small sacrifices are rendered useless. For example, will the hunger and famine in Ethiopia ever allow peace to be established in the country? On TV we see that very limited aid is being given to that country, but in this famine-ridden and economically shattered nation, such aid is hardly being used to feed the bellies of the starving people. A larger amount is spent helping the rebels or the armies of the governments to purchase arms so that the so-called leaders can retain control. Ethiopia is incapable of manufacturing weapons. So the weapons must be reaching them from powerful nations, or from particular factions in wealthy countries who have cast their net like the Mafia. Why have the powerful countries not tried to find a solution to this deprivation, cruelty and injustice in the world? Merely issuing a statement or summoning a meeting of a committee of the United Nations and expressing disapproval is not enough. Similarly, it is wholly inadequate for the powerful countries to express sympathy with the Palestinians on TV. Why can an effort not be made to establish peace in the same way as in Iraq and Afghanistan? I am not saying that what has occurred in Iraq and Afghanistan is right or wrong, but am merely pointing out that the more powerful countries took action according to their own perception to establish peace. A Public Inquiry about the Iraq War is taking place at present in the UK and many of the government officials involved are continuing to maintain that the war was justified, in spite of the fact that the vast majority of the UK public and its politicians consider the action to have been unjustified. Now the people of Iraq and Afghanistan are reacting in their own way to these acts in response. It was a presumption that if action was not taken against those in power, then there would be a grave threat to world peace, and so action was taken to preserve the rights of the people; but, on the other hand, was similar effort not required to protect the Palestinians from external attacks? Even if we suppose that the Palestinians initiated the war, such a disproportionate punishment could never be justified, whereby innocent children, women, elders and the unarmed are bombarded indiscriminately; an entire city is reduced to rubble. The Western media raised a great outcry, no doubt, and although the super-powers issued statements, no concrete steps were taken to stop Israel from continuing this cruelty. Can those innocent children who saw their homes being destroyed; who saw their brothers and sisters being killed without any reason; who saw their helpless parents targeted whilst pleading for their lives; can those innocent children ever erase those horrific scenes from their memories? Their inner frustration will make them anxious, and when this anxiety is manifested, it will result in further disorder and that will lead to a reaction to check it. And as is evident from the history of Palestine, such a reaction will, of course, lead to further cruelty on them. In today’s world, when an event occurs in one place, it is broadcast instantaneously throughout the world. As a consequence of witnessing images of such cruelty, Muslims will, no doubt, develop hatred, and such hatred will continue to increase. Malice and grudges in people’s hearts will multiply. There is already talk of this cruelty being repeated. Let us see what steps these major powers take to prevent this happening. The Holy Prophet, peace and blessings of Allah be upon him, has taught us that to develop peace and to remove hatred from your heart a person must help both the oppressor and the oppressed. Hearing this, his Companions said that they could understand the principle of helping the oppressed, but how could they help the oppressor? The Holy Prophet, peace and blessings of Allah be upon him replied that you can help the oppressor by stopping him from acting cruelly so that he can be saved from the Wrath of God. It is necessary, therefore, to take practical steps to stop cruelty, regardless of whether it is the mighty or the weak that are inflicting the cruelty. Peace will not be established merely by adopting UN Resolutions; practical steps must be taken. It is necessary to establish trust and build confidence and for this absolute equality must prevail. Differences between the rich and developed and poor and developing countries must be eliminated. All forms of veto powers should be removed and the finer points of justice need to be identified. We need to be loyal to our covenants, our obligations and our status, and this loyalty can only occur when it is followed to the letter and spirit of the law; double standards should be eliminated. Indeed, the media has also been calling for this. The Holy Qur’an has taught us how to fulfil the requirements of justice; it says that even if you have to testify against yourself or your relative then you must do so. How many matters are there that are presented in such an institution that was constituted after the Second World War so that the world could be saved from the horrors of war in future, where the major powers accept criticism against themselves and where they admit their own mistakes? The decision of not admitting one’s own error was taken at that time when the United Nations was formed and a provision for veto power was granted to the five major powers. The fundamental requirement for justice of even giving evidence against oneself was denied. How can this institute establish justice? The strange thing, as I mentioned before, is that they were not loyal to their own principles. Loyalty is borne from feelings of love and affection. At a personal level the feeling of love strengthens the feelings of loyalty. When a citizen loves his country then he exhibits allegiance and makes sacrifices for the sake of the nation. If sentiments of love do not exist, then the spirit of sacrifice cannot be formed. Unless a person loves another he can never have good feelings in his heart towards him and he cannot faithfully fulfil the rights due to that person. In an age where the electronic media has drawn us closer together, into what is called a global village, its benefit will only be felt when mutual goodness prevails. If, instead of good feelings, hatred emerges, if restlessness usurps heartfelt peace, then you must accept that this is not progress, but is something that will take you towards horrific destruction. Here, I wish to make something very clear, and that is the relationship of mutual love, affection and loyalty between one person and another cannot be established until a relationship of love, affection and loyalty with the Lord Who created us is developed. Distress and anxiety exist nowadays in a large part of the world’s population because the world has forgotten its Creator. People have forgotten the fundamental teachings of their faith. In fact, a great number of people even reject the existence of God. The Founder of the Ahmadiyya Muslim community has also taught us that the majority of Muslims and non-Muslims have forgotten their fundamental teachings and have gone far away from God. This growing distance from God and religion is increasing the restlessness in the hearts of people. And he said that he had come, therefore, to remove such distance so that the rights of God may be discharged and the rights of God’s creation may also be discharged with feelings of love and sympathy. When these teachings are acted upon then we will observe real peace; otherwise, agitation will once again bring about utter destruction in the world. With reference to peace, I would like to also say that turmoil and restlessness has spread all over the world and every possible way to reduce it should be adopted. Instead of unnecessarily interfering in the affairs of others and erecting walls of hatred, we should look to knock them down. The governments should not interfere where rights are not being violated. No laws should be proscribed regarding those matters that do not endanger the peace of the nation. Of course, where there is a threat to the peace of the nation; where there is a likelihood of harming the prosperity and progress of the nation; where the rights of citizens are unduly curtailed and where a person is made a symbol of hate due to his religion, there the Governments should interfere and legislate. Allegiance to one’s country should be infused amongst the entire society, and most importantly, the love of God should be instilled in the hearts of the people. As I said before, and as you are all aware, the world has come together and the measures of distances have changed, and in every country people of different religions live side by side. Therefore, it is necessary and it is the need of the time that within our cosmopolitan societies, the bond of love and affection should be strengthened. Respect and honor for one another should be inculcated. Allegiance to one’s country should be infused amongst the entire society, and most importantly, the love of God should be instilled in the hearts of the people. If these things are fostered then they will guarantee harmony within each country, and individual restlessness will be replaced by peace. Over the past few years the hijab, or veil, has been made an issue in Europe. In France, in particular, an uproar has been created, and now they are seriously considering legislation that would partially ban the hijab. Following on from France, politicians in other European countries, and for their own political motives, are issuing statements supporting a ban and this is becoming a means of injuring the sentiments of Muslims. Whenever I have reflected on this matter, I have never been able to understand what the problem with the veil is that it has become such a threat to governments. Is it such a heinous crime to wear a coat and cover one’s head and chin with a piece of cloth that an entire Parliament should sit to pass a law against it? If it is prohibited for a woman to wear a cloth on her head, then why are men allowed to wear caps and berets on their heads? This means that tomorrow a ban could also be proposed against such caps. I saw a cartoon recently in a newspaper in which a lady wearing a veil was standing next to a young man wearing a beret. The young man was saying to the woman, ‘no burqah’, and the woman was saying to the man, ‘no beret’. These issues thus have become a source of sarcasm; however, there are some sober-minded people in whose hands are the reins of the Executive and Legislature who should not interfere with such matters. Should legislation be passed against Christian and Jewish ladies who also adopt religious attire? If bans are imposed against the Muslims, then Muslim countries may impose restrictions on some forms of Western dress in response. This issue has the potential to snowball and it will affect the peace of the world. By all means, if there is any covering that hides the identity of a person and it is necessary to remove it to identify a person, then the governments or the authorities have the right to do so. But what a travesty, that a woman may be deprived from travelling simply because she is wearing the hijab; or a human life may be deprived of care in a hospital and left in the jaws of death because she was wearing a veil. Then, for example, an intelligent girl – who ranks at the top of her class, who is not just a Muslim, but an asset to the country in which she lives, is loyal to her country in every possible way, so much so that the love of her country is ingrained within her and she is willing to sacrifice all her skills and abilities for the sake of the progress of her country – and if this girl is prevented from carrying on her education only because she chose to observe hijab, not out of any compulsion, but due to her own free will; does this not render her bereft of her rights as a citizen? Will not this legislation that deprives her of education be the means of wasting a national talent? This law has not yet been passed in Germany, but due to the bye-laws available to the administration of some schools, an Ahmadi Muslim girl whom I know, who is among the top-ranked students, is being deprived of her education. And there are many examples like this. This national talent and the future of the country is being denied just because a Muslim girl wants to serve her country and at the same time wants to practise her religion of her own volition and happiness. A girl is being deprived of this right merely because she has a metre worth of cloth on her head. If this is a crime, then during the winter all European ladies will have to be deprived of their rights when they wrap their heads with scarves. Certainly, it is food for thought that whether it is such a crime to wear this one metre cloth, and whether wearing it renders a woman worthy of being deprived of her basic human rights. Is this a definition of modern democratic governments that claim to safeguard the rights of its people? Is this the way to bring together people of different nations? Is this the way to foster love and affection amongst people? Most certainly, every just-minded person will oppose this because these things will make the walls of hatred ever higher and destroy the peace of the world. Currently, the minarets of mosques have also become a major issue, in particular in Switzerland. I said recently at the 50th anniversary of one of our mosques in Germany, that if we suppose for one second that conspiracies are being hatched in mosques, then will bringing down the minarets stop such conspiracies? Firstly, not every mosque can have such an objection raised against it. I said in Germany with certainty, and I say it here as well, that not a single allegation can be proved against Ahmadi mosques in any part of the world, that they are spreading the message of hatred or rebellion. If you really want to make such an allegation, and if you really want to make the allegation of destroying the peace, then wherever the conspiracy can be found, remove it from the map. Indeed, if you become aware of any conspiracies being hatched in any mosque or other place of worship, then it is the responsibility of the government to take immediate action. However, to make it a general rule that Muslims always hatch conspiracies in places of worship will sow the seeds of hatred. Politicians in some countries make such statements as a means of cheap publicity. In Switzerland, it is only our mosque, the Ahmadiyya Mosque, that has a high minaret, and so in newspapers its picture is printed and it is referred to as ‘a symbol of peace and security’. Certainly, not all politicians are alike; there are some politicians who make it clear to even their party leaders that they are not in favour of such religious compulsion. These days the world is passing through a financial crisis. It is said that the recession has ended, that we have passed through the worst and that now we are emerging from it to recovery. But the public is still affected; jobs are still being lost; the purchasing power is still as affected as it was before. These are matters for governments and major steps must be taken, rather than making choices based on personal preferences. Will a woman wearing or not wearing a veil affect the economy of the country or the world? Will the wearing or not wearing of a veil or having or not having a minaret affect the moral value of a country or will it lead to recognition of the Creator? Will the wearing or not wearing of a veil or having or not having a minaret improve or harm the peace of the world? If it does, then I will be the first to accept it because Islam teaches that you should be willing to sacrifice something small for the greater good. But no! All these actions are strengthening the foundations of hatred. For God’s sake, in order to remove this hatred within your own circles, please act with justice, act with equality, and respect the feelings of others so that the peace can be restored, as has been said by so many guest speakers, almost – not almost – but all the guest speakers. Amongst us tonight, Lord Eric Avebury is present whom I gave the Ahmadiyya Peace Award to just now. I consider him to be extremely honourable because he has always been a stalwart and at the forefront of upholding human rights. May God enable him to continue this work further, because upholding human rights is the guarantor of world peace. Likewise there are a lot of other distinguished guests like Tom Cox, who was also a guest speaker and an old friend of the Community; Justine Greening, our MP for Putney; Laura Moffatt, MP for Crawley; Stephen Hammond, MP for Wimbledon and Siobhain McDonagh, MP for Mitcham and Morden. May they continue to work for the cause of developing peace in society as they have already spoken about it. It is my prayer that mankind understands the value of humanity and fulfils the rights owed to each other. Finally, I would like to once again thank all of you, who have come here with good sentiments and graced this occasion with your presence and shown respect for fellow human beings.